Is The KLCI Hinting Of A BN Victory With An Increased Majority? Many do not know this, but a country's stock market can actually be an accurate predictor of an election outcome. In any democratic country with a mature stock market and two major political parties, the prediction can be surprisingly accurate with up to more than 80% accuracy. We can see it even in the recent 2016 Presidential Election where the stock market predicted a Trump Victory. You can read about it here This stock market metric says the likely winner is...Trump which is an article on CNBC. I myself have done a bit of study into election predictions by the stock market. You can read more about it in this article I have written. How Stock Markets Around The World Have Correctly Predicted Elections 80% Of The Time. So this is not an isolated situation. That's because the stock market has indeed correctly predicted elections around the world 80% of the time. So how does the stock market predict an election outcome? So, if you study the US stock market in the 3 months prior to the 2016 Presidential Election, you will notice that it was drifting lower. This pointed out to a Trump Victory. So why does the market goes up if the incumbent is likely to stay in power? The simple reason is investors expect a status quo. There is no serious shake up in the government that will affect the country's economy. Therefore, investors are confident that there will be stability and this sends the market higher. On the other hand, if an opposition is likely to take power, then investors especially foreign investors will be afraid of what the future holds. With a new government, investors still do not know how they will play the economic cards. Therefore, to protect themselves, investors will start selling their stocks and this in turn depresses the stock market. What Is KLCI's Trend Telling Us Now About The Election Outcome? The chart above shows the weekly chart of the KLCI. 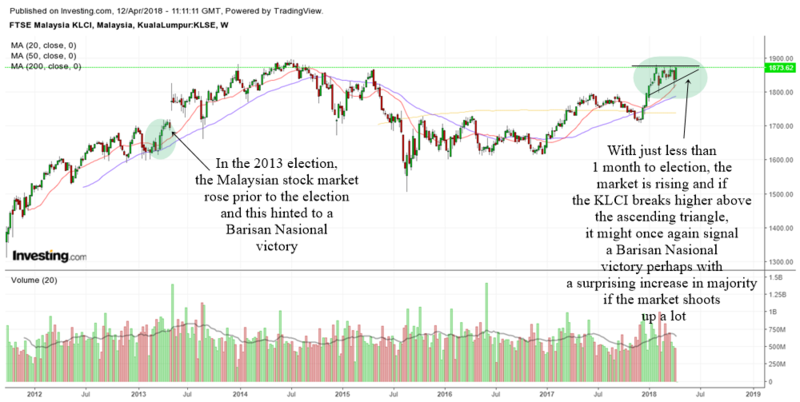 In the 2013 election, the Malaysian stock market rose prior to the election and this hinted to a Barisan Nasional victory despite it losing the popular vote. One must not forget that the Malaysian election system is based on First Past The Post system and in a way it is also similar to the way that the US President is elected. Which is why Donald Trump also won the Presidency despite losing the popular vote. Trump realizes this flaw in the election system and I remember he said on television once that he was there to win the Presidency and not the popular vote. Which is why he did not fly to campaign in California but important swing states. Coming back to Malaysia, it is still possible for BN to win the election despite losing the popular vote once again. With just less than 1 month to the polls, the Malaysian stock market has once again been rising. What is interesting is that the KLCI is perhaps forming a nice ascending triangle. The ascending triangle is a bullish continuation pattern and if the KLCI breaks out of this pattern and shoots higher, this not only means that BN may win. It may also point to us that BN might increase its majority in Parliament which might be surprising to many locals but not foreign investors. With the opposition now lead by former Prime Minister Tun Mahathir Mohamad, this brings back a familiar situation in the US where former President Theodore Roosevelt tried to win back the White House from his protege William Taft by setting up a new party. Roosevelt failed to win back the Presidency with the new party. It just seems that people are loyal to an established party rather than a person. The party machinery usually has a build in advantage over individual leadership. If history is any guide, this might explain why Tun Mahathir Mohamad will have an uphill climb to regain back Putrajaya. You can read more about President Roosevelt and his attempt to win back the White House in this Wikipedia article on the Progressive Party. I was watching an interview by Al Jazeera with Malalysia's Prime Minister titled Talk to Al Jazeera - Najib Razak: Malaysia's election challenge and nearing the end of the interview, the Prime Minister mentioned about his confidence about winning the election by pointing to a rising Malaysian stock market and Ringgit. This interview was done in 2013 and this shows us that the Prime Minister is indeed aware of how the stock market can hint of an election outcome. I have embedded the interview below near the point where the Prime Minister mentioned it. You can check it out below. p.s. if the video does not start at the point, fast forward to 22:30 onwards and listen from there. A foreign investor will always want political and economic stability in a country. From a foreigner's point of view, the Malaysian 2018 Election might be less exciting than the one back in 2013. If you compare the 2013 election to the 2018 election, it was very clear cut that if BN loses, Malaysia will have a completely new regime in place. Things would have to start all over again in almost all levels of government and economic stations. Which is why if the opposition were to win the 2013 election, the market will of course fall prior to the election. In this 2018 election, it is more of a fight between 2 major political dynasties. The Mahathir legacy and the established Razak legacy. Both are from Barisan Nasional. One who is the current leader of Barisan Nasional and the other one a former leader of Barisan Nasional. Whether the Malaysian voters realize it or not, whoever they vote for and whatever the outcome of the election, the country's politics and economy will still be controlled by Barisan Nasional. "A rose by any other name still smells the same". Whether it is Parti Pribumi or Barisan Nasional, whoever wins, the foreign investor is still familiar with the ways these 2 leaders will lead the country which is why the election outcome will probably be not much of a significant consequence to the stock market. So does the KLCI hint of a BN win this time? The Malaysian stock market may be forming an ascending triangle and if it breaks out, the KLCI may make new highs and this will be good for local as well as foreign investors.